In a previous post I emphasized the importance of the synagogue that was found at Andriace (a port visited by Paul). In the remains of the synagogue a number of marble plaques were found. The excavator believes that the synagogue was located in the upper floor of the building and that the inscriptions/plaques fell from that floor to where they were found (commentary/data from the museum in Antalya). This is one of several inscriptions/plaques that were found in the synagogue. It measures 2.9 x 1.4 ft. (87 x 44 cm.). 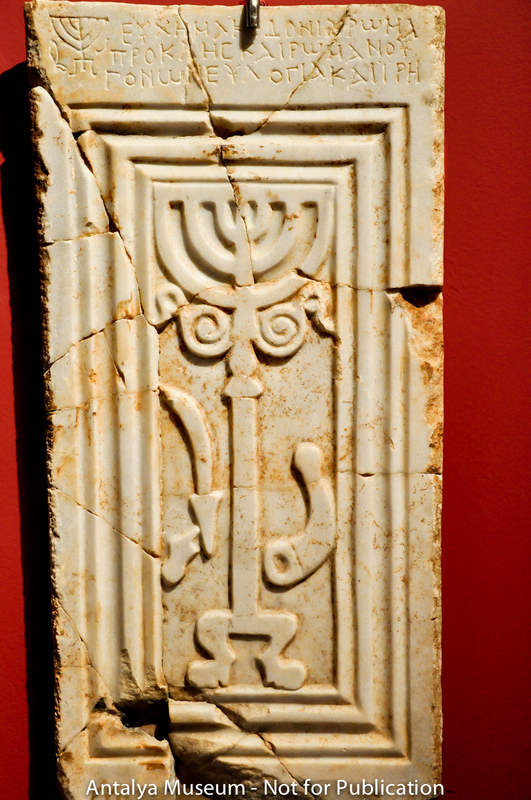 Note in the main panel the seven branch candelabrum (menorah) that is standing upon a tripod (two legs are visible)—these are typical symbols of Judaism during this period (compare the capital found at Capernaum in Israel). On the lower right is a shofar (ram’s horn) and to the lower left an etrog and a lulav (symbols associated with the feast of Succoth [tabernacles]) are visible. Some have suggested that the two “curls” just below where the seven branches join the stem of the lamp are Torah Scrolls. 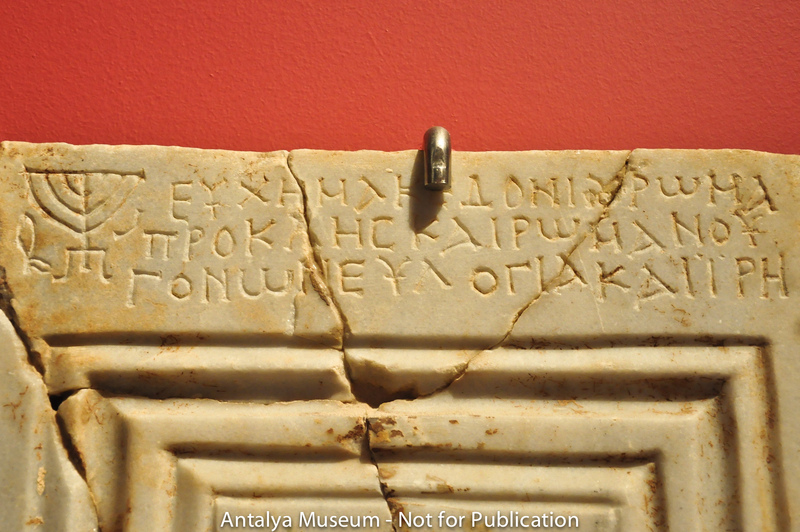 The excavators believe they have discovered a mate to this plaque (with a completion of this inscription, but only partly preserved in its upper portion; see Çevik et al. below). Note the second, smaller, menorah (seven branch candelabrum), on a tripod and a shofar (ram’s horn) and a lulav (associated with the feast of Succoth) in this upper portion of the larger plaque. The excavators believe that a similar, partially preserved, plaque was placed next to this one, and on this mate, this inscription is completed. Prokle and their parents Romanos and Theodote. [Bracket] = estimated missing text and underline portions are from the second plaque/panel (pictured in the article noted below, p. 363). Nevzat Çevik, Özgü Çomezoglu, Hüseyin Sami Öztürk, and Inci Türkoglu, “A Unique Discovery in Lycia: The Ancient Synagogue at Andriake, Port of Myra.” Adalya XIII (2010), 335–66. To view additional images of Andriace Click Here. Hercules Farnese of Perge and . . . .
A beautiful second century A.D. statue of Hercules was found in the baths of Perge. 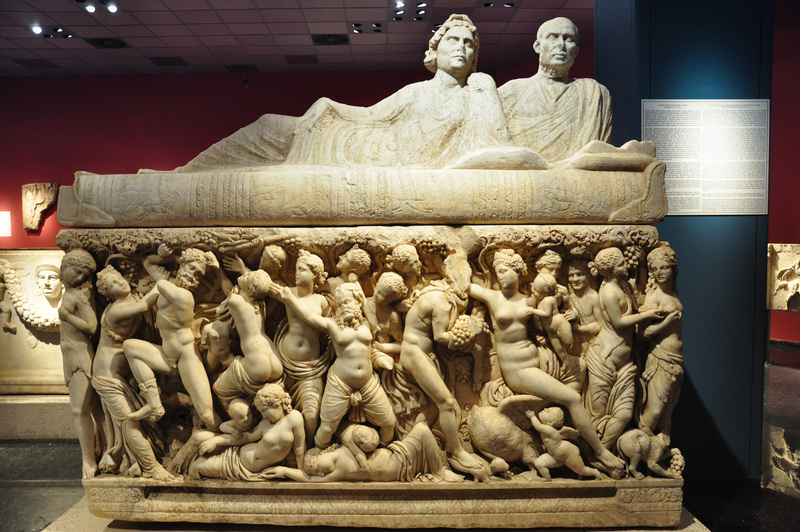 The Boston Museum of Fine Arts returned the top portion of the statue to Turkey in September 2011. Prime Minister Mr. Recep Tayyip Erogan personally brought the important portion to Turkey himself. Portions of over 60 such statues are known and are called the “Hercules Farnese” (named after a famous Italian collection now housed in the Naples National Archaeological Museum). This is a Roman copy of a bronze original. Note the positioning of the head, arms, and legs, and especially the body muscles. The skin of conquered Nemean Lion flows down on his left side as it tumbles to the ground. 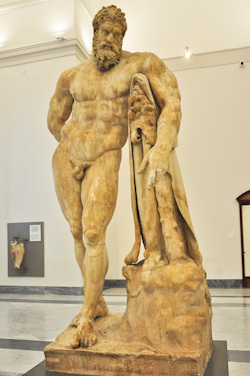 Below is THE Hercules Farnese that is displayed in the Naples National Archaeological Museum. Below is a five (5) in. 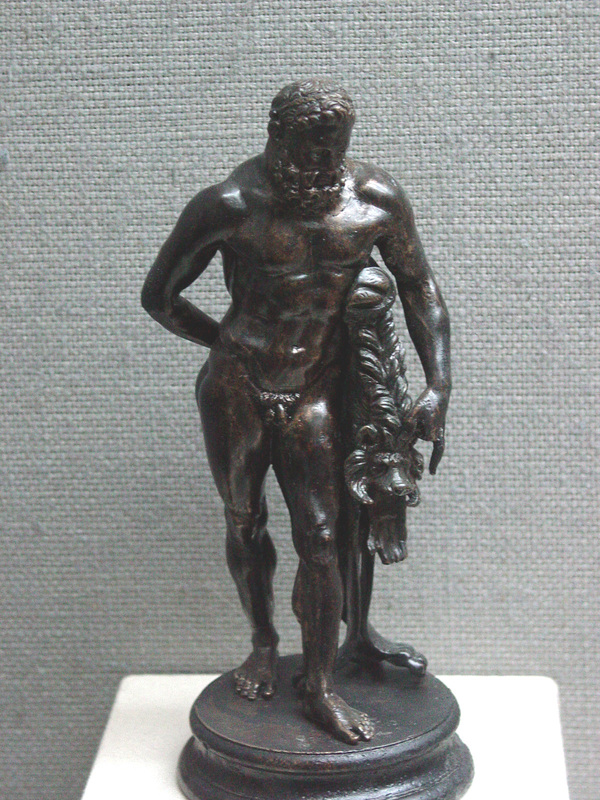 high image of a “Hercules Farnese” found at Pergamum and displayed in the museum in Bergama. 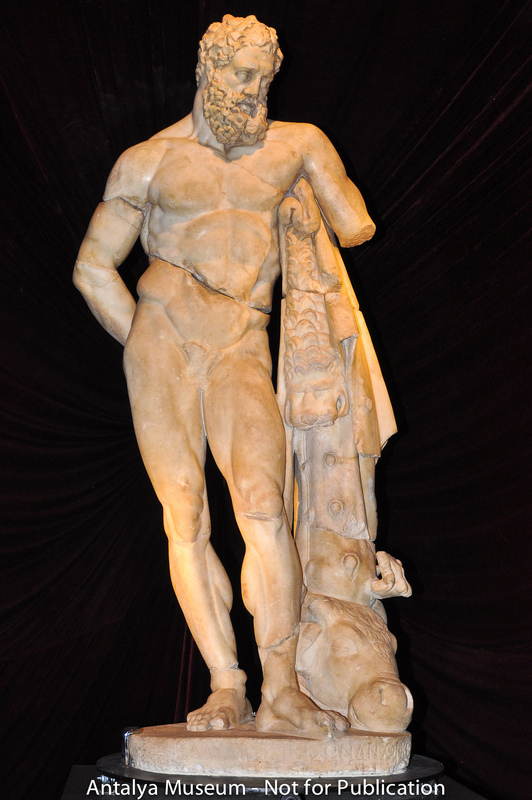 Heracles was the son of the god Zeus and a mortal Alcmene. 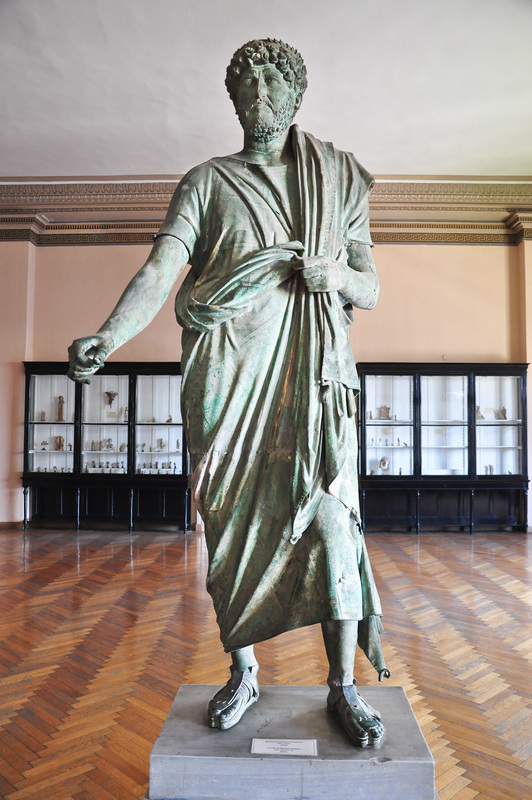 Although originally a mortal, he eventually attained divine status and was widely worshiped throughout Greece. 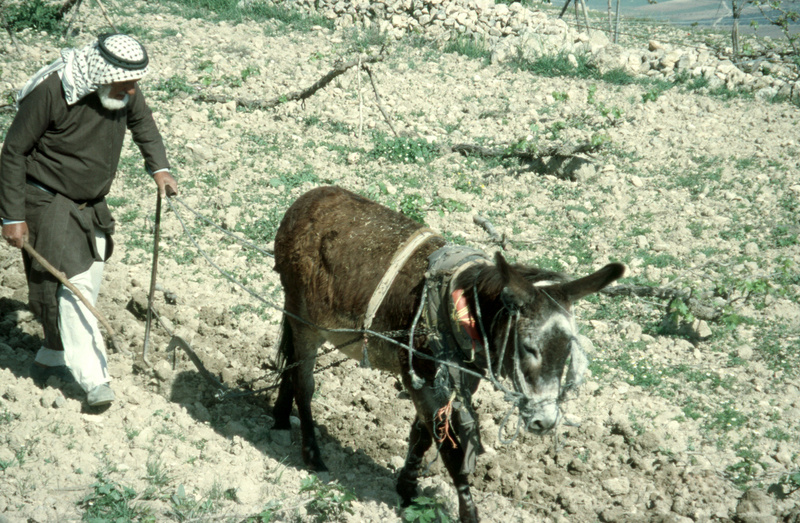 As punishment for killing six of his children he had to perform 12 “labors” (= very difficult tasks). 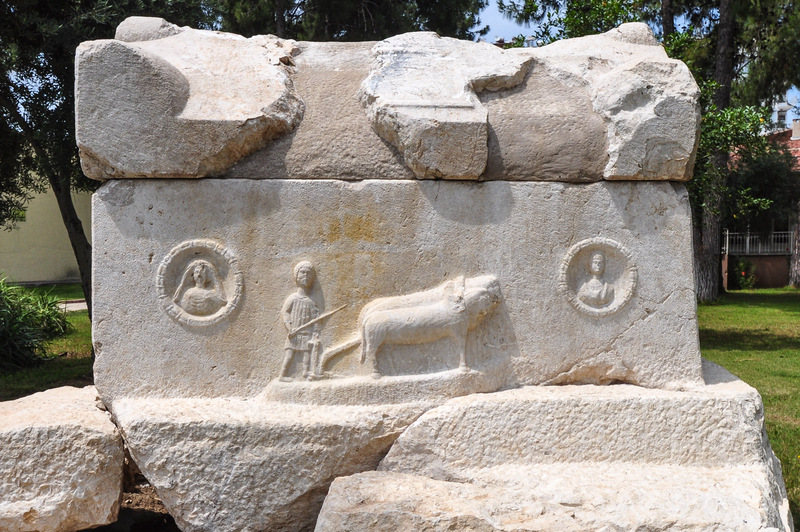 The first of which was to kill the Nemean Lion. He wrestled with the lion, strangled it, and subsequently used its pelt as a cloak. 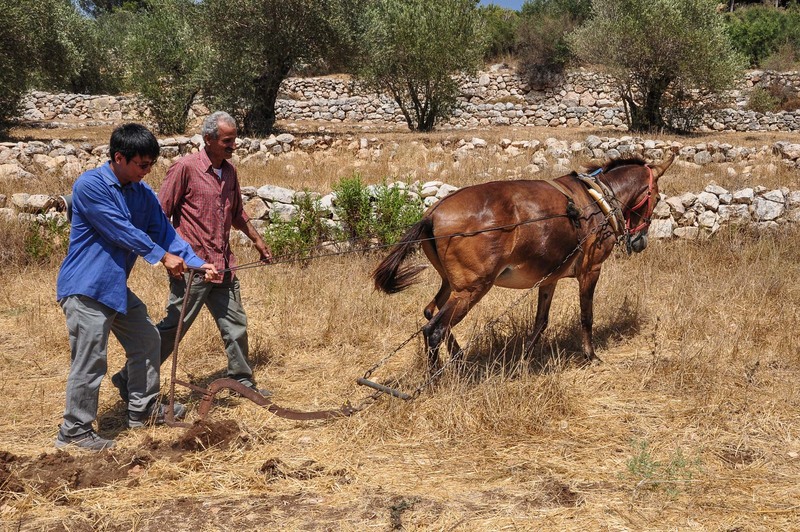 (Nemea is a site in the Peloponnese region of Greece). Groups traveling to Turkey will often fly into Istanbul and spend a day or two there before continuing on to other parts of the country. One of the stops in Istanbul is typically the world-class Archaeological Museum located near the Hagia Sophia and the Topkapi Palace. For students of the Bible it houses some extremely important artifacts. The main ones are located on the top floor of the museum including the Siloam Tunnel Inscription, The Second Temple Warning Inscription, and the Gezer Calendar (the first two from Jerusalem).